Is there a way to draw mirror/symmetric shapes in Inkscape? To clarify, I am asking about mirroring the shape while I'm drawing it, not to draw it and then mirror in. According to this Inkscape Forum entry the mirror path effect is included in a recent development release, but it is not (yet?) available from the current stable release. Here is how to clone and a tip for symmetric workflow. It is focused on a single path. You can also group an object (Ctrl+G) and use the cloning process described below on that, allowing you to create new objects within that group that are then imitated by the clones as well. With some starting object selected, go to Edit->Clone->Create Tiled Clones and in there the first tab is called symmetry. There is a whole selection available here but, what you want is the reflection one. Set rows, columns to 1 x 4. Why that is will be explained at the end. The first clone appears above the original, the second to the right. If you have already used this function before, the old values still exist and you may need to reset all relevant tabs. For working on the original after deselecting it (/selecting sth different), just select any clone and use Shift+D id est Select Original. You can also delete the clone above your original. Which makes accidental deselection of the original less unlikely. Finalizing and removing middle-node inaccuracy/gaps/duplicates in cloned paths. Selected the 3rd and 4th clone and unlink both by pressing Shift+Alt+D and then join the by pressing Ctrl+K. In the Node Edit Mode, draw a selection frame around one middle node and its mirror node and from the options at the top, below your task bar, select join nodes. Repeat for each middle-node pair. By having cloned the tile four times you now have one final object of your design, and one working copy, ready for changes. Cloning the original again automatically removes any remaining unlinked clone, before creating the new ones. Just never join the original with a copy, otherwise you lose your working copy. 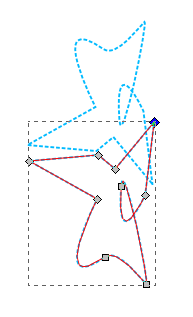 The Live Path Effect (LPE) "Mirror symmetry", incorporated in Inkscape 0.92, is perfect for this. Short description here: 0.92 release notes, mirror symmetry. Demonstration video here: Mirror Simmetry LPE for Inkscape. How to draw a wing cascade with boundary layers?